Data Subject Access Requests (under Article 10 of the Data Protection Act 1998) are powerful tools that allowed people to request a copy of any information held on them by organisations (with some exceptions). In order to provide a response, a fee of up to £10 could be charged. With the new GDPR era, these fees are no longer going to apply, and the access requests will now be covered by Section 94 of the Data Protection Act 2018 (which is set for Royal Assent today). As a result, I suspect we will be seeing far more of these requests… and given how underprepared most organisations have proven to be with the DPA 98’s mechanisms, it will be interesting to see how they cope. I decided to investigate the process myself with none other than the UKVI. Formerly known as the UKBA. The visas and immigration people. I’m pretty sure they must have some interesting information on me, especially given that my spouse is a foreign national. Written confirmation that your passport is a ‘true likeness’ of you. Interestingly, they ask for a lot more information, including your parents’ date of birth, etc. This is noted as being ‘optional’, but still presents itself in such a way that it seems like it might be required. Let’s repeat after me: Data Subject Access Requests should not be an excuse to mine more data. I chose not to provide any more details than was necessary. 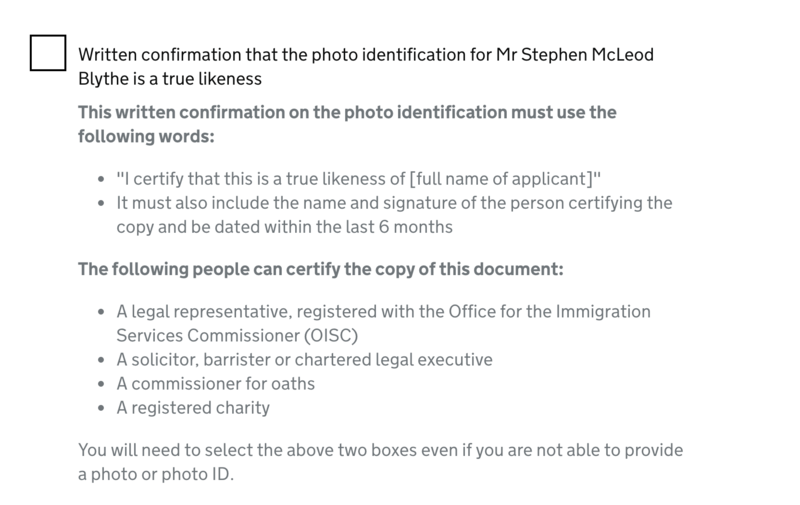 This means that the requirements for verifying ‘likeness’ are higher to get information held on you by the UKVI, than they are to get a passport in the first place. Despite making the application online, I also apparently can’t submit the evidence online – so I’m not sure what the point of offering such a service is in the first place. I have just submitted a Data Subject Access Request under s.10 of the DPA 98 and s.94 of the DPA 2018 (which just received Royal Assent). This should further be considered in light of Article 15 of the GDPR. 1. A copy of my passport. 2. A ‘written confirmation of true likeness’ from a third party. 3. A letter of permission. Firstly, I want to point out that there is no way to provide these documents online, despite the initial application being made online. I therefore request that you agree to receive items 1 and 3 electronically, rather than by post. Secondly, I object to the requirement to provide a written confirmation of true likeness. As you will be aware, data controllers are required to undertake ‘reasonable measures’ to verify the identity of the person making the Data Subject Access Request. I submit that by providing a copy of my passport, and the passport number, that this more than satisfies the legal requirement. Further, I submit that since the list of those who are considered appropriate to provide this written confirmation is less extensive than those who can act as a counter-signatory for a passport application in the first place, that this requirement is demonstrably disproportionate, and as such not required to respond to my request. 1. You will accept items 1 and 2 from the above electronically. 2. That the written confirmation of true likeness is not required to give effect to the request under the relevant law. We will see what happens. Should my subject access request be denied, then it would appear that the UKVI really are requiring a disproportionately high standard to verify people for their Data Subject Access Requests, and I’ll need to revisit it at that point. Stay tuned.